ANOTHER moon mission, another sensational sunrise. And another big sigh of relief. Pardon me for sounding like the ground control team at NASA, but the countdown to these full moon walks is proving a nervous one. This is Scotland after all, and no matter how good the forecast for the mountains, there's always the chance it can fail to live up to expectations. While it's preferable to have good conditions, I've got enough experience to get the head down and get on with it whatever the weather. I don't feel quite so confident when I have company. Then I feel a responsibility to provide the full mountain experience, and a guilt if it proves a disappointment. I know it's not my fault, but I can't help feeling that somehow it is. I dragged you up here with promises of great things and all you get is a colder, wetter version of the non-view you had below. So even with a perfect forecast for the arrival of full moon No.6 of the year, I still had internal grumblings as I prepared to meet the team from BBC Scotland's Landward. 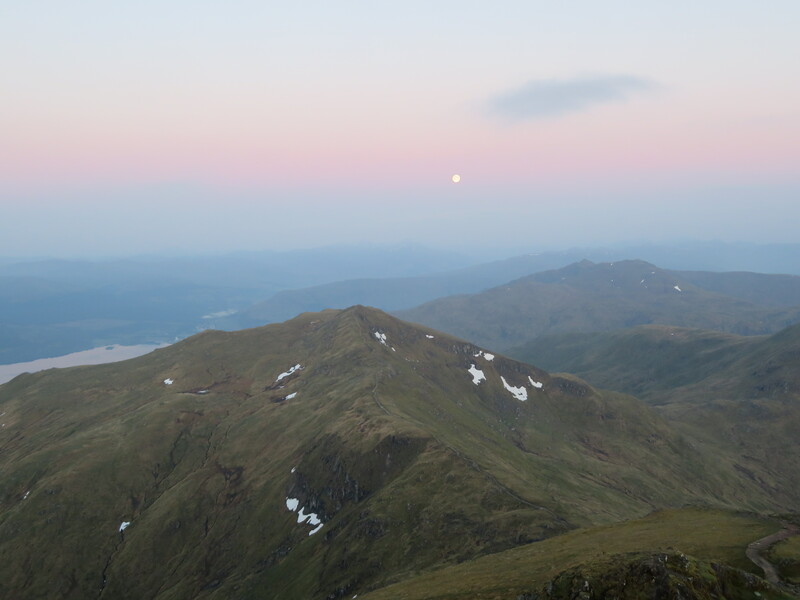 This was the Flower Moon, and we were heading for Ben Lawers, the tenth highest Munro and the highest point of the chain of seven big mountains above Loch Tay. It seemed a fitting match; the Ben Lawers national nature reserve contains the most celebrated collection of rare mountain plants in Britain and is a magnet for botanists from all over. All we needed was a perfect night. It looked promising as I headed along the loch with the sun going down in an explosion of pastel pinks and oranges, the fall-out washing over the water. A couple of hours later and the moon was in full control. The Flower Moon is said to be the brightest of the year and this one was trying hard to live up to that reputation. At this time of year there is almost perpetual light and the jagged silhouette of the skyline to our north was a hint that we wouldn't have to wait too long for a new dawn. A short moonlight scene-setter in the car park with presenter Dougie Vipond and then five of us were off on the boardwalks and stone steps of the restored track heading for the black ridge ahead. 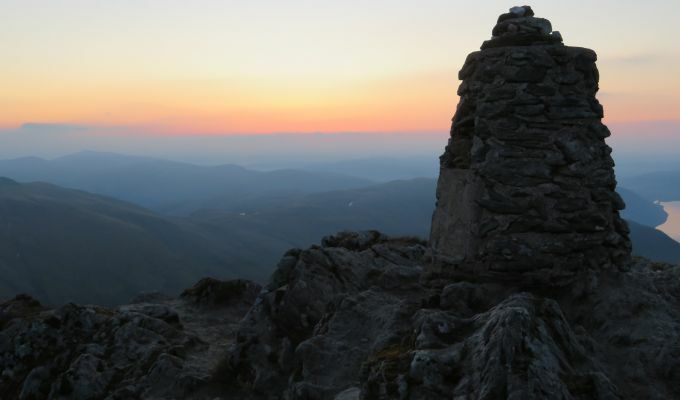 The walk up to Ben Lawers goes over another Munro, Beinn Ghlas, and takes just over two and a half hours. When you are with a film crew though, that time is stretched. 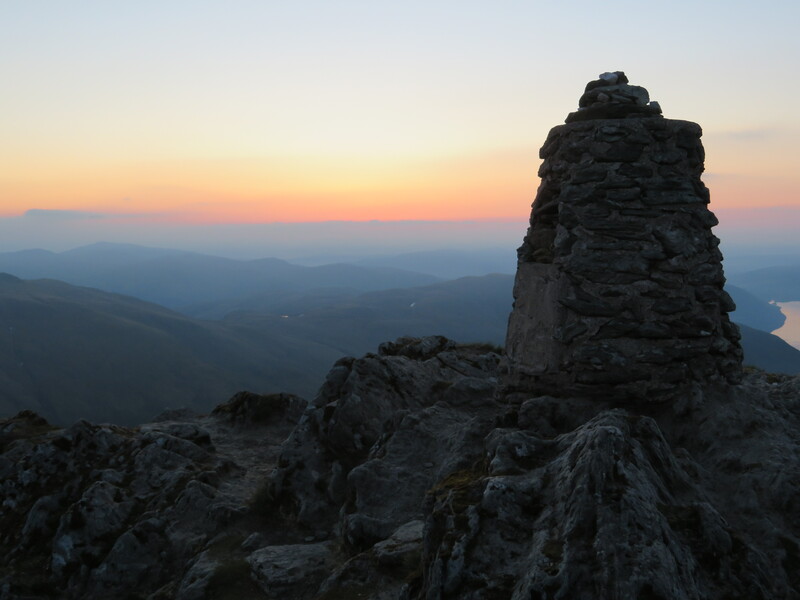 We had something like four hours to reach the Lawers summit for the sunrise at 4.38am. It isn't like ScotRail – the sun would be up bang on time and we had to make sure we didn't miss the moment. We had a couple of filming stops before Beinn Ghlas, then one shortly after on the ridge, with the morning glow on the horizon behind Ben Lawers and the pulsing moon still dominating the skies behind us. Poor Beinn Ghlas. It is one of those hills that suffers from being such in close proximity to a mightier neighbour. It would be easy to stroll past its summit without thinking. Even the cairn has that can't-be-bothered look, a small jumble of stones which spills down the side of the hill, yet in another place it would be a significant mountain, one of the higher Munros. Location really is everything. Our latest filming stop had shrunk our remaining time dramatically. How long to the summit? Forty minutes. How long do we have? Forty minutes. The slight chill we had felt at the last stop was burned off immediately on the non-stop push up the steep final slope. We arrived at the top with five minutes to spare, everyone having built up a good sweat. Dougie and I took our positions at the cairn. Then we caught the first glimpse of the burning red crown on the horizon and watched as the sun came up fast, changing from red to deep gold to yellow to brilliant white, every stunning second caught on film. The beauty of such a simple event is immeasurable, and it's always fascinating to watch the reactions of those around you during this transformation. Dougie couldn't drag his eyes away. Cameraman David was in his element, changing position to catch every possibility. Kirsty and Susan were torn between their production duties and snatching every glimpse of the light show they could. My over-riding emotion this time, however, was one of relief. We had managed to catch a perfect moon and a perfect sunrise.